Pirate wallpaper, wall decals and stickers can be used to put the finishing touches on a pirate baby nursery theme or rooms for older kids. 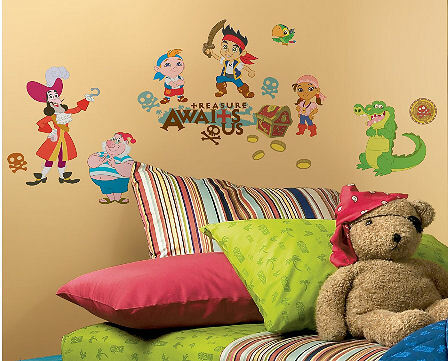 Everybody loves pirates and you are going to go crazy over the collection of pirate wall decals that we have for you. Captain Hook, Jake and the Never Land Pirates nursery wall decals are sure to strike the fancy of any fan of story of Peter Pan. 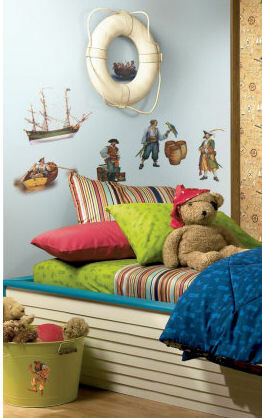 Captain Hook, Jake, Izzy, Cubby, Mr. Smee and other storybook characters add an atmosphere of fun to any kid's room. Simply apply the stickers to the nursery walls, furniture or any other flat surface (always with safety in mind) to enhance your pirate nursery theme in just a few moments. This happy crew is happy and smiling at the prospect of digging for buried treasure in the sand. A sticker collection including a map with directions to buried treasure, palm trees on a desert island, a ship boat and a chest filled with gold coins are just a few of the elements that add a layer of color and adventure to a set of pirate baby bedding no matter what the color. 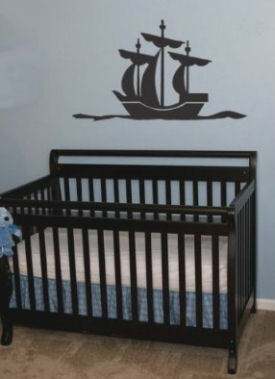 If the thought of compromising the nursery color scheme is an issue, a pirate quote decal with words in a neutral color may be just what you need. 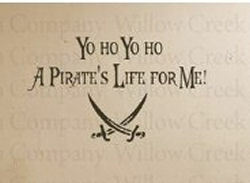 A decal with crossed swords and a line from your favorite movie or a quote can be custom ordered in any color you need. 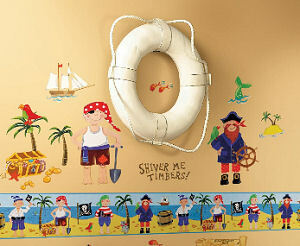 The saying might serve as a focal point or as part of a complete pirate wall mural. An added bonus of using stickers rather than pirate wallpaper is that it's easy to modify the wording to leave out the word "rum" or anything else that you might not want on the kids' walls. To avoid an overabundance of pirates some parents decorate with ships. This would make it very easy to change the nursery's decor from a pirate to a sailing theme. Using a combination of stickers and pirate wallpaper border often provides pleasing results. Pirate wallpaper murals makes it easy to create the background with classic scenes from the pages of their favorite storybook, Peter Pan or Pirates of the Caribbean movie. When decorating a room for a baby girl simply switch the focus of the pirate wallpaper border from Captain Hook to Tinkerbell! Please make plans to visit Unique Baby Gear Ideas often to see the latest in wallpaper trends for your nursery decorating project.